We hit our £85,000 stretch goal early on today, and it looks a lot like we'll be past £90,000 in funding by the time the campaign finishes in just 17 hours! 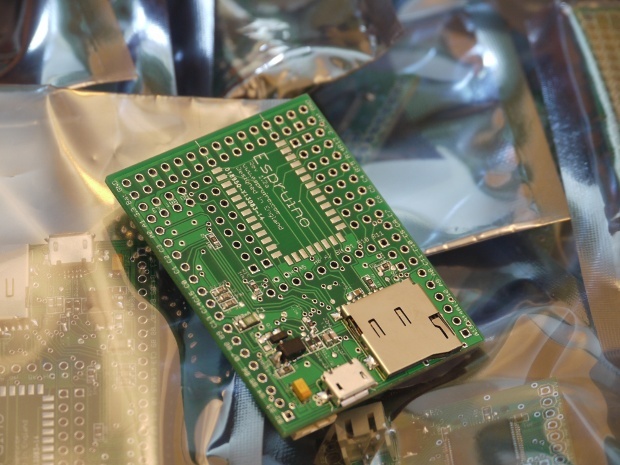 On the hardware front we got our rev 1.2 hardware prototypes back today - just in time for the 5 backers that have got the 'Impatient Developer' reward. They work perfectly! These have micro USB (as requested), a new low power voltage regulator, reverse voltage protection, and even a self-resetting 1A thermal fuse to make sure that it's extremely difficult to cause any damage, even if you short them out! We're really happy with these, but we may still make a few more minor changes before we send them out. On the software side things are moving ahead nicely, and we're tidying up and applying the MPL licence ready for our source code release tomorrow! @Howard: just use another browser for another account or delete the cookies. @Howard: You have to change the pledge level, so from Low Power Wireless Kit to Wireless Experimenter Kit. If you want both you have to register a second account with Kickstarter and use this for the second pledge level. How do you add a reward to a previous selection? I tried adding a Wireless Experimenters Kit to my previous pledge for a Low power Wireless Kit. But I couldn't find any way to tell KIckstarter I wanted both items. Yes, MPLv2. I'm pretty confident the developers will get on quite well - the software itself has been around for almost a year so it is pretty stable. It's just a matter of adding features to it. It'll be interesting to hear back from those impatient developers how well they get on with the board. MPL v2 I presume?